This is a postscript to my last post. I wanted to share this sweet, sweet picture with you. This is Grandmother Iva with her son-in-law, Harvey. He is saying 'grace' and is thanking God for Grandmother's many years of life. I think it's a very precious picture and wanted to share. Such a sweet story and pictures! Amazing that she's 104. My grandfather (father's father)lived until just shy of his 100th birthday. 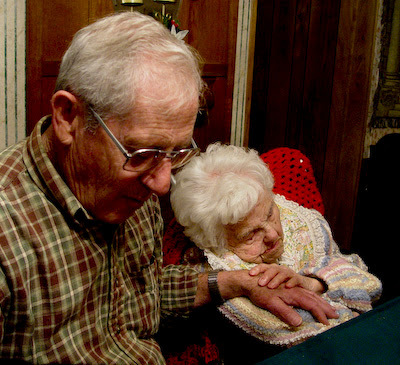 His courtship story with my grandmother is very romantic, like this one. I'll have to write about it some day! Thanks for reminding me of it. Ahhh, yes, as I was saying...a life well lived. What a sweet, sweet story. Thank you so much for sharing! Aw, isn't that sweet. Bless her little blessed heart. I love this picture...how precious. Thanks for sharing her story. I love the biographies of everyday people. I find them much more interesting than the lives of the famous. What a special photo, it could win a prize! !